I used the latest opinion poll data to create a personality test that tells people how they should vote in the Scottish referendum. If you have not done so already, you should take the quiz now and share your result. 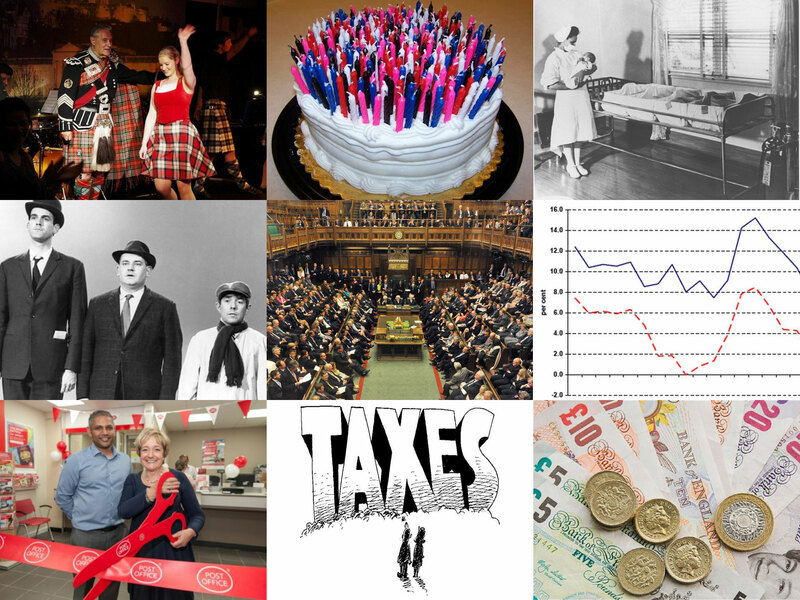 There are nine questions in the quiz covering gender, age, place of birth, socio-economic status, party political affiliation, the economy, public spending, taxes and currency. 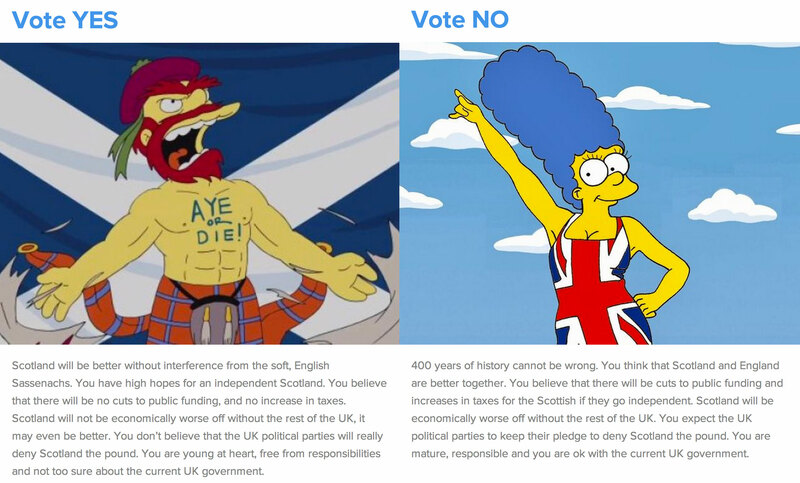 The answer to each question determines whether you end up being told that you should vote Yes or No. If you have taken the test and are wondering how you ended up with your result, the graphs below should help you. Each graph represents the data that sits behind each of the nine questions. By quickly scanning through the graphs you should be able to work out how your result was calculated. And remember, all this data is real and is based on the very latest opinion poll. There are six NRS Classifications based on the occupation of the head of the household. In order to simplify things for the quiz I just made it about whether you work in an office or not. 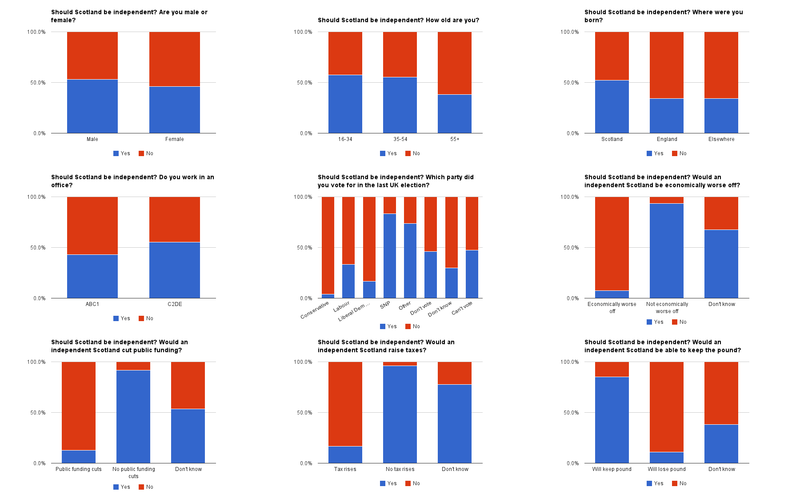 What is clear from the opinion poll data is that economic issues are the key factor in determining how people will vote. I have been using quizzes and personality tests a lot in my recent work here at Import.io. They are a great way of sharing and using data to inform and educate an audience because they change the relationship that the audience has with your data and your message. Usually when we talk about data we are using it to tell big stories about general concepts and aggregate trends. As an individual these big-concept stories can sometimes be quite difficult to relate to. A personality test changes that. It uses aggregate data to create something that is very personal to the individual. And the individual is left with something that they will want to share, which will help to spread your message further.